Sydney began to build the biggest stadium in the history of the Olympic Games in September 1996. By March 1999, the jewel in Sydney’s Olympic crown was complete. With 110,000 seats, the Sydney Olympic stadium was the largest the Games had ever seen, taking the record from the 101,000-seat stadium in Los Angeles, host of the 23rd Olympiad in 1984. The stadium project cost approximately £302million. This included £246million in design and construction costs, £14million in surrounding precinct works and £42million in development and financing costs. There was a further £36million invested in the stadium after the 2000 Olympics. The post-Games reconfiguration work involved the installation of an oval arena, moving stands on the east and west, roofing over the north and south stands and a new tier on the north stand. In its final configuration, the Stadium has a capacity of 82,000 for oval sports, such as AFL and cricket, and a capacity of 83,500 in rectangular mode for rugby union, rugby league and football. It can switch between these modes regularly. The bulk of the construction costs – more than £250million of the initial £302million – was funded through private debt or equity and the balance through the New South Wales government. 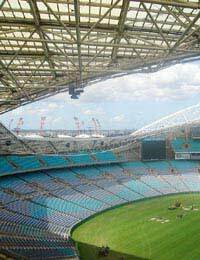 When the lease expires in 2031, the stadium reverts to NSW government ownership. Throughout the Sydney 2000 Olympics, indeed from the time the stadium opened in 1999 until 2002, the area was known as Stadium Australia. In 2002, telecommunications company Telstra acquired naming rights, and the stadium became known as Telstra Stadium. Then, in 2007, ANZ Bank clinched a sponsorship deal worth around £14million over seven years and so the stadium’s name changed again, to ANZ Stadium. As the flagship arena for the Games of the 27th Olympiad, the stadium hosted the opening and closing ceremonies, track and field and the Olympic football final, allowing huge audiences to witness some of the most significant and memorable events of the Sydney 2000 Olympics. The stadium featured a Mondo Sportflex Super X 400metres, eight-lane track, with nine lanes in the front straight. At the north end of the stadium were two shot circles, one concentric hammer/discus circle, a javelin runway and two double ended pole vault runways, while to the south were two shot circles, one concentric hammer/discus circle, a javelin runway and two high jump areas. The steeplechase water jump was on the outside of the main track, and two combined triple jump, long jump and pole vault runways were on the outside of the track on the back straight. It was this arena that saw the defining moment of the Sydney 2000 Olympics. Cathy Freeman, who had been given the honour of lighting the Olympic flame to start the Games, brought a packed stadium to its feet with a rousing run in the women’s 400m final. It was a performance the whole nation had been waiting for and, as Freeman became the first Aboriginal to win a gold medal in athletics, it was a moment of great symbolism for the new Australia.